Just when I thought it was going to be a quiet weekend—BOOM!—the 2,204-page Medicare Access and CHIP Reauthorization Act of 2015 (MACRA) final rule hit my inbox on Friday morning. I was surprised to see the rule available 2 weeks shy of its November 1 deadline, and even more surprised at its colossal size. Nevertheless, one phrase kept coming to mind, How do you eat an elephant? One bite at a time. Trying to consume everything in one fell swoop would give me a severe case of indigestion. My first proverbial bite at this behemoth will make this blog post larger than most, but hang in there with me. If you feel like you are still hungry for more, don’t worry, we guarantee you’ll be seeing a lot more on this topic in the upcoming weeks. After all, the new quality payment program (QPP) will start on January 1, 2017. Okay, now I feel a little bit of indigestion kicking in. Physicians, physician assistants, nurse practitioners, clinical nurse specialists, and certified registered nurse anesthetists are considered eligible clinicians in MACRA. This list will grow as the years go on. You’re also a part of the QPP if you bill Medicare more than $30,000 a year (up from the proposed $10,000) and provide care for more than 100 Medicare patients a year. The upping of the low-volume threshold amount will now allow around 380,000 clinicians to be excluded from MACRA. 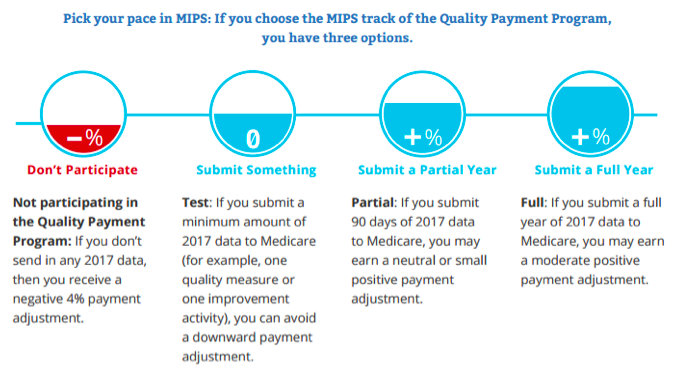 For those in the MIPS track, the payment adjustment amount will range from +/- 4% in 2019 to +/- 9% by 2022. In addition, MACRA allows for up to $500 million each year in additional positive adjustments for exceptional performance. In total, CMS estimates around $3 billion will be allocated to positive adjustments over six years. For those in the Advanced APM track, you will have the opportunity to receive a 5% lump sum bonus each year from 2019 to 2024. Clinicians will not see any monetary changes due to MACRA until 2019. The payment adjustment year is 2 years ahead of the actual performance year. Around 73% of Medicare clinicians will be subject to MIPS. The other 27% will either be excluded due to low threshold or will be in the Advanced APM path. Most notably, the cost category will be reweighted to 0 and the 10% will be reallocated over to quality in the first year. As expected, CMS finalized 2017 to be a “transitional” year. Meaning they will allow clinicians to pick their pace when submitting data and will lower the reporting period to 90 days vs a full calendar year. For the transitional year, the performance threshold will be lowered to a threshold of 3 points. Clinicians who achieve a final score of 70 or higher will be eligible for the exceptional performance adjustment. For 2018, the performance period goes back to a calendar year (kind of). Clinicians will need to report a full calendar year for the quality and the resource use/cost categories. However, the other 2 categories (CPIA and ACI) will still allow for a 90-day reporting period due to upgrading EHRs to the 2015 ONC edition. Not too much has changed here. CMS finalized the need to report on 6 quality measures (with at least one being an outcomes measure). In the proposed rule, they also called out the need to report on at least one cross-cutting measure—but that got axed. If an outcomes measure is not available that is applicable to your specialty or practice, you’ll need to choose another high-priority measure. Another alternative would be to report all measures in a specialty set. If the measure set contains fewer than 6 measures, MIPS eligible clinicians will be required to report all available measures within the set. If the specialty set contains more than 6 measures, the clinician will only need to select 6. Sorry nephrologists, much to my dismay, there is no specialty set for you. Our beloved CKD measures group has sailed off into the sunset. Instead, you will need to dig through the full list of measures to find ones most suitable for your scope of practice. If your group is in an APM (but not eligible to be in the Advanced APM track of MACRA), your measures will automatically be reported through your APM. A full list of measure can be found in the final rule or this interactive website. I’ll be spending the majority of this blog on the much-anticipated category of ACI! The new MU has undergone some drastic changes from the proposed rule in order to make it easier for clinicians to succeed (by lowering the amount of required objectives to report and upping the ability to receive bonus points). 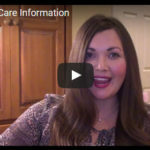 The advancing care information category is made up of a possible 100 points in order to earn a perfect 25 in the overall MIPS composite score. The first 50 points (aka the base score) can be earned by reporting data for the following 5 required objectives (down from 11 in the proposed rule). Failure to meet the base-score requirements will immediately give you a 0 in the entire ACI category! The other 50 points will be earned from a combination of your performance percentages in measures of your own choosing and/or through bonus points. The final rule held onto the concept of awarding up to 10 points for each percentage-based measure. Points for each measure are calculated by taking 10% of the performance score. For example, a 90% in a given measure will earn the clinician 9 points. If you are between decades (such as an 85%), you would round to the nearest whole number—in this case an 85% would be 9 points. The list of objectives also remained the same. The only difference is that the immunization measure is no longer a requirement (as it was in the proposed rule). Instead, it is an optional measure, much like the others that are not listed in the base score above. Also, clinicians cannot report the e-prescribing measure as one of their performance-based measures due to the fact that many clinicians already score high in this measure today. The final list of objectives are below (depending on your EHR edition). If you still are struggling for a decent ACI score, you will have the opportunity to earn bonus points. A clinician who reports data to a public health agency or clinical data registry can earn a maximum of 5 bonus points (this is up from the 1 bonus point initially proposed). New to the final rule is the concept of earning bonus points for using a certified EHR (CEHRT) to meet a clinical practice improvement activity. A clinician can earn a maximum of 10 percentage points if he/she completes an improvement activity using CEHRT. A list of all eligible CPIA activities that can earn an ACI bonus can be found in Table 8 of the final rule. For nephrologists who’ve been clinging onto their hardship exemption card—it’s still available to you, however, it may not be as enticing as it used to be. Taking a hardship will reweight the ACI category to 0, thus overweighting the quality category of MIPS to 85% in 2017! More on ACI and hardship exemptions in a future blog post. This newbie was altered slightly from its initial introduction in the proposed rule. In order to meet this category and earn the full 40 points, clinicians must report on 4 activities (down from 6 in the proposed rule) for a minimum of 90 days. Groups with fewer than 15 participants or those in a rural or health professional shortage area will only need to select 2 activities. 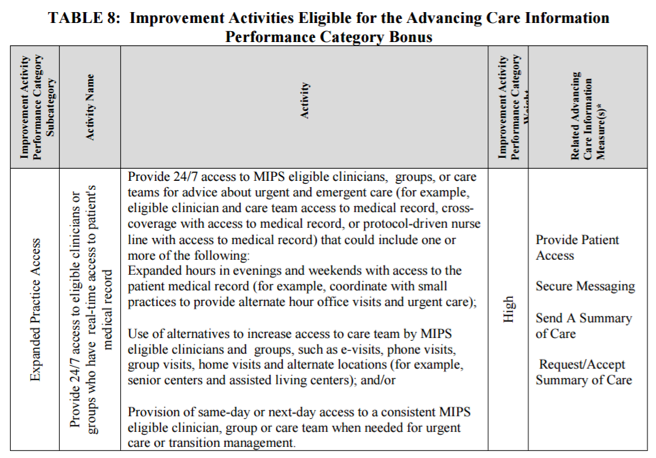 As mentioned in the ACI section above, if you choose activities that can be met by using a certified EHR, you will be allowed to earn bonus points in the Advancing Care Information category. Perhaps the biggest change to the MIPS composite score is the reweighting of the resource use/cost category to 0 in 2017. The 10 proposed points will be reallocated next year to the quality category of MIPS instead. CMS will still send clinicians their feedback reports to let them know how well they are doing in 2017, but the resource use category won’t actually affect a clinician until the 2018 performance year. It’s extremely clear that CMS wants everyone out of MIPS and into the Advanced APM track of MACRA. They estimate that around 250,000 clinicians will be considered qualifying APM participants (QPs) by 2018. Being part of one of the above is only half the battle. The second prerequisite to being a QP (and avoid MIPS) requires that a clinician meet payment or patient requirements during the performance year. In order to qualify for the 5% APM incentive payment in 2019, you must be a part of an approved advanced APM, and have 25% of Medicare Part B payments through the Advanced APM OR see 20% of your Medicare patients through an Advanced APM. For performance years 2017 and 2018, the participation requirements only apply to Medicare payments and patients. Starting in performance year 2019, clinicians may also meet an alternative standard for Advanced APMs that will include non-Medicare payments and patients. In 2018, CMS is also considering the addition of the accountable care organization (ACO) Track 1+ model. The Track 1+ model incorporates more limited downside risk vs Tracks 2 or 3 of the Shared Savings Program, yet enough financial risk that it would qualify as an Advanced APM. The addition of Track 1+ requires that clinicians eventually make their way over to Tracks 2 or 3. A lot of clinicians are probably a bit gun shy to sign up with a 2-sided risk agreement by January 1. It may be worth doing the minimal reporting for MIPS in 2017 and use the year to assess which (if any) advanced APMs would work for you. Expect a lot more on this topic in a future blog post! The final rule is quite different from the proposed rule and has been given positive reactions from the AMA and MGMA. I’ll go ahead and reserve my judgement until I can take a deeper dive. As Dr. Ketchersid often says, the devil is in the details. It’s also worth mentioning that the final rule isn’t quite final. CMS is offering a 60-day comment period as part of their iterative approach in designing the landmark change. They even released a new website with educational resources, however, I found it quite lacking. Hopefully they load it up with more materials ASAP! Well, I think I should stop here. I could go on and on but I need to save some goodies for later. How do you feel after reading this summary? A bit relieved or are you tipping over your bottle of antacids? We’d like to hear your first impressions below! Thanks Diana for posting! Since there really won’t be any quality-specific measure for any nephrologist using Acumen, will Acumen be providing an extensive list of measure to choose from? We will definitely be providing a list of quality measures for you to choose from that we feel are “nephrology-friendly”. Fantastic summary! Keep up the good work! We nephrologists rely heavily on your interpretations of these complex rules. I appreciate the kind words! Understanding all of this complex material for nephrologists is part of my full time job – and I still find it extremely confusing. I can’t imagine what I would do if I were a Nephrologist (or any provider for that matter) in today’s world. Thanks you for reading the blog! Excellent summary. Appreciate it. Every long journey starts with the first step. I like the flu/pneumonia/tobacco measures for nephrologists. However, do they apply to patients we see in the dialysis unit? Or only office patients like PQRS? Why do you think they want everyone in an APM if they have a program called MIPS for the ones that don’t want to do an APM? Also, how many ESCOs are there in the country? How many are LDO versus other. What has been the experience of the first ESCOs? The quality measures are all different. In order to calculate who is in your patient population (denominator), the quality measure provides you with a list of CPT codes to understand your eligible encounters. Most of the individual measures are not related to ESRD encounters. For example – the tobacco screening measure will need to be answered for all patients that had the following visit (90791, 90792, 90832, 90834, 90837, 90845, 92002, 92004, 92012, 92014, 92521, 92522, 92523, 92524, 92540, 92557, 92625, 96150, 96151, 96152, 97003, 97004, 99201, 99202, 99203, 99204, 99205, 99212, 99213, 99214, 99215, 99406, 99407, G0438, G0439). As for CMS’ stance, they believe Advanced APMs contribute to “better care and smarter spending by allowing physicians and other clinicians to deliver coordinated, customized, high-quality care to their patients within a streamlined payment system.” They also state that it is the easiest path to move from a fee-for-service (FFS) payments to payments for quality and value. As for your ESCO questions – if you don’t mind sending me an email offline, I can hopefully put you with the right people to answer your questions!